On a lovely warm sunny Sunday in October, we took 15 Cubs, six Leaders and one Young Leader by minibus and cars to Twinlakes Family Theme Park in Melton Mowbray. This is one of our favourite places to visit for a fun day out, with lots to see and do and just ideal for Cub age. The Cubs thoroughly enjoyed everything that was on offer in the various Zones they worked their way round, with such names as Excalibur Adventure Zone, Au Guang Dragon Zone, Action USA Zone, Canada Quay’s Zone and the two indoors Labyrinth Venture Zone and Buccaneers Island Zone. 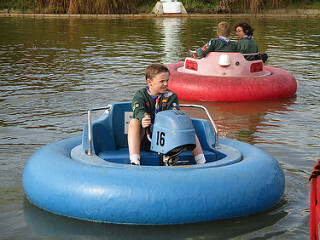 There was a variety of rides within each Zone to go on with some of the favourites being the Buffalo Stampede Coaster, Water Flume, Joust-About-Ride, Jester’s Revenge, Sky Flyer, Sledges, Indy Karts and Bump Boats. The last hour or so of our day was spent in the two indoor Zones with large play areas, giant slides, ball pits, mazes, Trauma Terror ride and lots more. The Leaders, much to their delight, were also allowed to play as well! All in all, another wonderful day out for the Cub Pack.